Classroom package supporting university classrooms with eye tracking technology and knowledge. This package provides Tobii Pro eye trackers and licenses to our proprietary analysis software, paired with an extensive spectrum of knowledge resources and services. At Tobii Pro we meet clients—both corporations and academic institutions—every day. We hear from our corporate clients that there is a growing demand for people who are experts in all aspects of eye tracking. Universities have a unique opportunity to meet this growing demand by equipping students with eye tracking tools and opening up doors to their future by teaching them how visual attention can be analyzed and applied to many business and research fields. 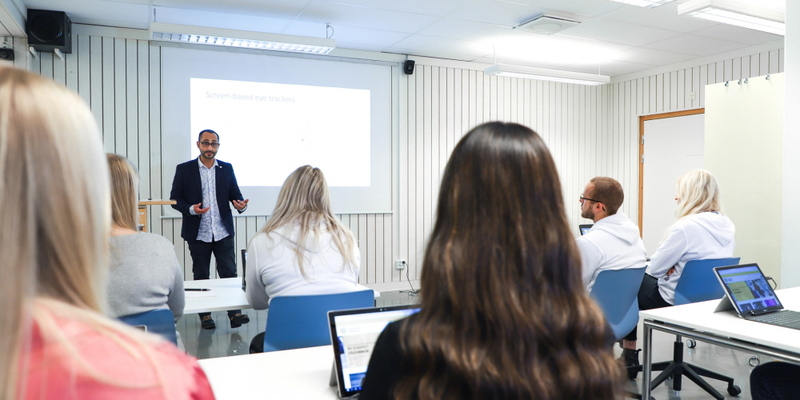 To support universities with eye tracking technology and curriculum development, Tobii Pro has established an academic program that consists of specific package options for both classroom and lab settings. The Tobii Pro Classroom package offers a set of eye trackers and licenses to our proprietary software. It also contains knowledge resources and services, including support for curriculum development, so you can be up and running quickly. Equip an entire classroom with the latest eye tracking technology, or provide students with a portable research lab as part of their curriculum to demonstrate how eye tracking can be integrated as a tool to answer research questions.